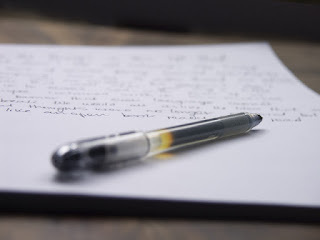 Today, I'm going to continue on Jill's wonderful Top 3 post on Combatting a Creative Block by adding some of the things I've learned from my 8 Tips for Curing Writer's Block post. With my mom's Air Force history, she tells us that if we sweat more in practice, we'll bleed less in war. That's a gung-ho way of saying prevention is the best cure. Oftentimes, I get amazing ideas... when I don't need them or can't use them. I'll be in the middle of a tough edit for my current story, and I'll find a dozen story ideas clamoring at the gates of my mind. Or I'll be in the middle of a debate round and come up with an idea for a great case. Keep a journal with you (or a running list on your phone) of ideas and things that inspire you. These can be writing prompts, quotes, pictures, stories, or character sketches. Pinterest can also be a useful tool, if you don't spend too much time on it. By keeping a list of creative ideas flowing when you have them, you might be able to stop the block before it starts. Grab a patient friend or family member, someone who is personally invested in you and, consequently, your story. Ask when they'll be free, because if you try to drag their attention away from another project, you're fighting a losing battle. You want their minds to be solely focused on the problem you're facing. Explain it to them and hear what they have to say. Their ideas might be completely useless, but those ideas might create a domino effect, inspiring you to create more of your own ideas. 3. Let Go and Let GodStrangely enough, I’ve found that at the source of my stress is a lack of faith. I’m preparing for my next speech and debate tournament, trying to keep up with my personal blog and this blog, trying to edit my manuscript, trying to get scholarships to go to an expensive college, and trying to get a driver’s license. Several times, I’ve wished that there were more than 24 hours in a day. Then I might have a teeny tiny chance of getting everything done. But God made 24 hours in a day for a reason. He knows what I can and can't do in 24 hours, and His plan doesn't require anymore of me than what I have. If God wants you to write this manuscript, He has a plan for it--from that pesky scene that doesn't have the right pacing to the agent who's going to represent it. Trust that by pursuing God's calling for your life, He'll take care of the details. What's the biggest problem that stops up your creativity? How do you deal with creative blocks to your writing?